Alright, this isn't a recipe so much as a cookbook recommendation. 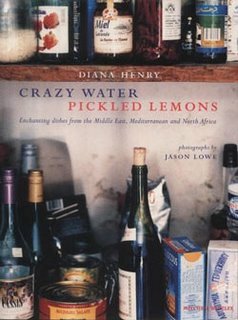 This is a great book by the British food writer Diana Henry, a sort of encomium to Med/Middle Eastern/North African cooking. Brilliant stuff, gorgeous photography, and rocking recipes. Nancy, the brilliant-but-obsessed artisan baker and owner of The Tree Stone Bakery shared this one with me. Check it out if you can! posted by Matthew Francis | 1/26/2006 02:42:00 p.m. Totally. I'd imagine you might be alble to find it used, since it's a couple of years old now. Who knows? The Bookman might have it. I was sad to see neither the public nor university library had this (in Calgary). and the cover, it's beautiful! I actually saw it in person when I was at the Farmer's Market last week, the inside looks good too. But alas at $40 I couldn't take it home. Yeah, that's pretty pricey. I was happy to borrow it!